"Three-quarter close-up of a blue Lamborghini Aventador SV Roadster in a futuristic tunnel with light tones. " Cropped image detailing the blue door and front wheel. 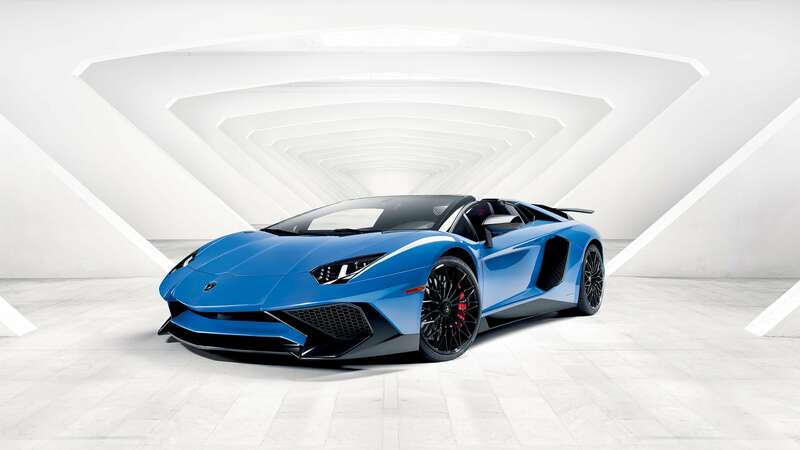 Discover the Lamborghini Aventador Superveloce Roadster: what's new, its features and detailed technical specifications. The groundbreaking innovations we introduced with the Aventador marked the beginning of a new era for Lamborghini's iconic super sports cars. With the Aventador SV, we truly reinvented the concept, and with this model we have given it something more: the vanity of a Roadster. The Superveloce has been designed as the sportiest Lamborghini ever, the fastest and most electrifying of all time, thanks to a further improved naturally aspirated V12 engine, engineering solutions geared to extreme lightness, and a mix of innovative technological features, such as the magnetorheological push-rod suspension and the Lamborghini Dynamic Steering system. A Roadster super sports car at its purest, designed to give you a driving experience that exceeds extraordinary. Discover all the features and detailed technical specifications for the Aventador Superveloce Roadster. Side view of the rear half of a blue Lamborghini Aventador SV Roadster racing along by a mountain lake. The utmost care has been taken over the performance of the Lamborghini Aventador Superveloce Roadster. Full control of the vehicle in all conditions, a naturally aspirated short-stroke V12 engine which has been made even sportier, and an exclusive interior made from the most exclusive Italian materials. All this in addition to the unique experience of feeling the thrill of a race with the open air around you. This is the Aventador Superveloce Roadster. Every element of the Aventador Superveloce Roadster has been added on – or taken out – so that the equation could be kept constant, and the car's extreme lightness uncompromised, in line with Lamborghini's style and design. Extensive use of Carbon Fiber Reinforced Polymer (CFRP) and other refined materials made it possible to achieve an unprecedented reduction in weight: a full 50 kg less than the Aventador Roadster. The incredibly sporty nature of the Aventador SV Roadster can be recognized in every line, and is highlighted by the choice of the materials, including the ultra-lightweight carbon fiber used for the air vents, rear spoiler and bumpers. Cropped three-quarter front view of a blue Lamborghini Aventador SV Roadster as seen from above. Three-quarter view of a blue Lamborghini Aventador SV Roadster in an interior well lit by a wall of windows. Full side view of a blue Aventador SV Roadster in an interior setting well-lit by a glass ceiling. Cropped image of the bumper and headlight of a blue Lamborghini Aventador SV Roadster. The interior of the new Lamborghini SV Roadster once again demonstrates Lamborghini's commitment to taking the Aventador to its purest essence. You won't find any soundproofing or navigation systems, but instead you will be able to touch the bare structure of your car. The carbon-fiber monocoque that forms the passenger compartment is actually visible at multiple points, also featuring in the materials used for the doors and sports seats, while the leather and Alcantara® upholstery stays true to the luxury and quality typical of Lamborghini. Unmatched performance, thanks to the power of a naturally aspirated V12 engine and the ability to manage it according to your needs, together with the quality and the exclusiveness of the finest materials, skillfully crafted by the best Italian artisans. Among the materials used is carbon fiber, which features in the interior as well as the sports seats; this is combined with the racing graphics of a high-tech control panel, and the roar of the 750 CV champing at the bit just behind your back coupled with the thrill of seeing the sky above you. Though significantly reduced in weight, the short-stroke naturally aspirated V12 engine has become even sportier, if this were possible, with a maximum power output of 750 CV and a maximum speed of up to 8,500 rpm. Front and rear magnetorheological push-rod shock absorbers. This is the ultimate active suspension system. It compensates for roll and undesirable movements of the vehicle body, guaranteeing the perfect response in all driving conditions. It reacts perfectly, ensuring the Superveloce never lets you down. The revolutionary Lamborghini Dynamic Steering system continuously adapts both the force required to operate the steering wheel and the steering ratio to provide greater maneuverability at low/medium speeds and improved stability at high speeds. The result is perfect driving dynamics. Thanks to our customization program, you can choose from a wide range of colors for the exterior, interior, stitching, cockpit materials and brake calipers. The combinations are practically infinite and allow you to have a unique Aventador SV Roadster.